Splitting axe. Handle made of FIBERGLASS composite. Length 40 cm. Weight 1000 g.
Universal axe. Length 40 cm. Weight 1000 g.
Splitting axe. Handle made of FIBERGLASS composite. Length 55 cm. Weight 1200 g.
Universal axe. Length 50 cm. 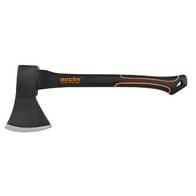 Weight 1500 g.
Splitting axe. Handle made of FIBERGLASS composite. Length 63 cm. Weight 2000 g.
Universal axe. Handle made of NYLON and FIBERGLASS. Teflon coated blade. Length 35 cm. 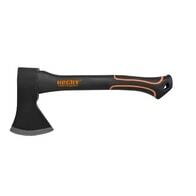 Weight 570 g.
Universal axe. Handle made of NYLON and FIBERGLASS. Teflon coated blade. Length 44 cm. Weight 900 g.
Matlock. Length 91 cm. Handle made of a special composite material which is reinforced with glass fibers - Fiberglass. Splitting axe. Handle made of special composite material which is reinforced with glass fibers - Fiberglass. Splitting axe. Handle made of NYLON and FIBERGLASS. Teflon coated blade. Length 44 cm. 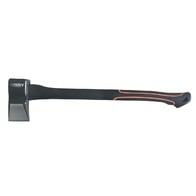 Weight 950 g.
Universal Axe, length 35 cm, weight 650 g. Handle made of glass fiber composite handle FIBERGLASS. Splitting axe. Handle made of NYLON and FIBERGLASS. Teflon coated blade. Length 59 cm. 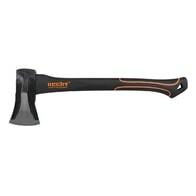 Weight 1170 g.
Splitting axe. Handle made of NYLON and FIBERGLASS. Teflon coated blade. Length 70 cm. Weight 1550 g.
Universal axe, length 59 cm, weight 1130 g. Handle made of glass fiber composite handle FIBERGLASS. Splitting axe. Handle made of NYLON and FIBERGLASS. Teflon coated blade. Length 80 cm. Weight 2550 g.